A weapon that can be used under water as well as on land has been developed in Tula. Efforts to create weapons for underwater combat personnel began as soon as the world’s navies began to deploy underwater saboteurs — in other words, during and after World War II. Only the Soviet Union, however, succeeded in creating genuine, automatic weapons and pistols capable of firing under water. Almost half a century later, the SPP-1 4.5mm pistol and the APS 5.6mm assault rifle began to be used by the Soviet navy’s special reconnaissance forces. The guns fired arrows and were effective under water, though not on land. Of course, it was possible to hit an enemy who broke the surface, but only at point-blank range. The weapons were not accurate at distances of 164 feet or more, and their stopping power dropped off very rapidly. The service life of the underwater assault rifle when fired in the air was not more than 180 shots. No one in the world succeeded in replicating Russia’s underwater automatic weapons technology. However, combat divers going on a mission had to take two pistols and assault rifles with them: both the underwater APS and SPP-1, and the conventional Kalashnikov assault rifle and Makarov pistol. This was inconvenient, but it seemed impossible, in principle, to create a weapon that could fire equally well in the two environments. Tula’s arms manufacturers have managed to achieve this impossible objective. The idea and basic design were devised by a prominent small arms designer, the late Vasily Gryazev. The assault rifle was built by his colleagues and students working at the Central Design and Research Bureau for Sports and Hunting Weapons. The bureau is part of the KBP Instrument Design Bureau, which is famous for its guided missiles and rapid-fire guns. KBP in Tula is not involved in instrument design (it makes weapons, including small arms), but was described as such in Soviet times in order to confuse spies. A unique underwater cartridge, the same size as standard assault rifle ammunition, was also invented here. Development of the special, dual-medium (capable of operating in two environments), 5.45mm assault rifle — known by the abbreviation ADS — was completed in Tula in 2007. It is not named after an individual designer, since the new weapon was the work of a large team. Under water, the ADS fires 5.45x39mm cartridges, and, in the air, it discharges classic cartridges of the same caliber: The magazine of cartridges for underwater firing can be swapped for another filled with conventional cartridges for the standard Kalashnikov. The ADS also has an under-barrel grenade launcher that takes VOG-25 and VOG-25P 40mm grenades. It can also be fitted with a tactical silencer and various sights. The assault rifle embodies many features that are regarded as quite unusual in Russian weapons. Take the “bullpup” design alone: Usually, the pistol grip and firing mechanism are located in front of the magazine and the action is fitted in the buttstock. This design makes it possible to substantially reduce the size of the assault rifle, while maintaining a long barrel. The ADS does not have a conventional buttstock; instead, it rests on the shoulder with a part called the backplate. 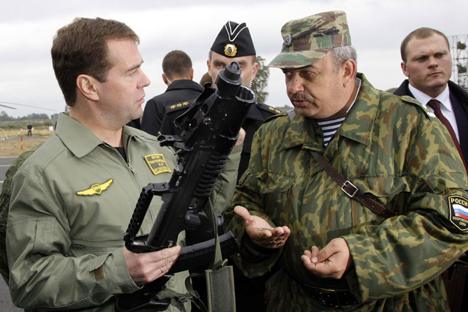 This is the first Russian-made weapon to eject spent cartridge casings forward while the chamber is closed. This reduces the amount of gas in the user’s face and makes it possible to fire from the right or left shoulder without swapping any parts. The assault rifle is therefore equally easy to use for right-handed and left-handed shooters. The ADS makes extensive use of composite materials, making is possible to reduce the weight of the weapon and, at the same time, to increase its corrosion resistance. A gas regulator has been added to the gas system, making it easy to switch between “water” and “air” gas operation. Steven Seagal: New face of Russian arms and robotics? This is the first assault rifle in the world to fire equally well both in and out of the water. Notably, it is as good as the latest models of Kalashnikov-type assault rifles, while being smaller in size. An assault rifle of truly revolutionary design, without parallel to the West or East of Russia, has been created. The ADS was developed for underwater combat personnel, but its successful and universal design means that it could be used to equip not only seaborne special forces but also all of the Main Intelligence Directorate’s special forces, marines and land forces. The assault rifle has undergone a complete cycle of operational tests and received a positive reaction. It is now in trial use. A decision on whether to bring it into service may be reached in the near future.